5 Mile Walk/Run supports 15 local programs in Monmouth County New Jersey & around the world through Church World Service Global. We usually talk about things like food, and water when we talk about CROP Walk and funds raised supporting local and global programs to help feed the hungry. They also help support the work that Church World Service does to provide critical help for refugees and immigrants. 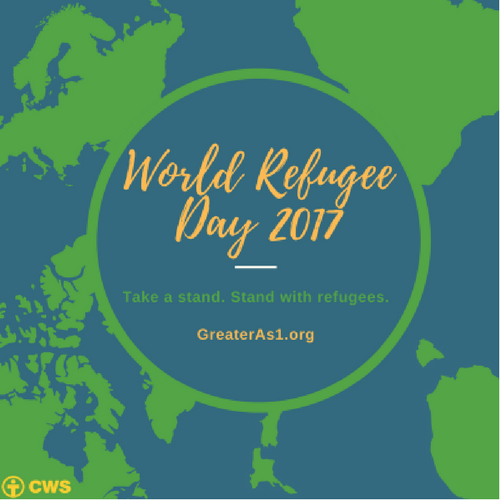 Today on World Refugee Day, we'd like to share some information on how CWS is involved in this massive and ongoing refugee crisis. We use the world "massive" because a recent report from the United Nations Commission for Refugees reported that over 65 million people have been displaced in 2016 because of violence or persecution. "Church World Service reports that every five seconds a person is displaced in the world today. This means that on any given day, thousands of people are being forced to leave their homes. CLICK here to learn more about the work CWS is doing. Over the past seven decades Church World Service has responded and adjusted their mission and services to meet the changing needs in the United States and around the world. We agree that you can't feed the hungry and ignore the root causes and situations that put people into such extreme poverty. Whether it's environmental causes and disasters like drought,floods, and earthquake, or violence from war and conflicts; the need exists and work must be done to provide assistance to people as they struggle to survive. Watch this short VIDEO which tells the story of 70 years of Church World Service and highlights the work accomplished with help from you. Your efforts and fundraising in CROP Hunger Walks help make this possible.